Applying Cognitive Science to Education: Thinking and Learning in Scientific and Other Complex Domains by Frederick Reif ’48. Reif draws on his knowledge of the brain and on years of experience as a college professor to provide educators with teaching strategies that better align with students’ thought processes and learning needs (The MIT Press, $38). Blindfold Chess: History, Psychology, Techniques, Champions, World Records, and Important Games by Eliot Hearst ’53 and John Knott. Hearst and Knott delve into the history of and psychology behind blindfold chess, a variation on the traditional game in which participants play without ever seeing the chessboard (McFarland & Co., Inc., Publishers, $65). The New Music Theater: Seeing the Voice, Hearing the Body by Eric Salzman ’54 and Thomas Desi. The authors examine the recent emergence of alternatives to opera and mainstream musicals in American theater (Oxford University Press, $39.95). Lionel Trilling [’25] & Irving Howe: And Other Stories of Literary Friendship by Edward Alexander ’57. Alexander describes the close relationships as well as the enmities that developed between several pairs of important literary figures during the 19th and 20th centuries (Transaction Publishers, $34.95). 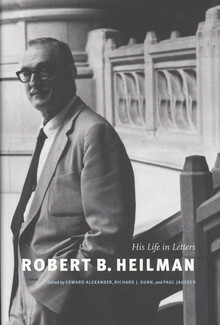 Robert B. Heilman: His Life in Letters edited by Edward Alexander ’57, Richard J. Dunn and Paul Jaussen. During his many years as a college administrator and English professor, Heilman distinguished himself as a defender of academic freedom and a proponent of the New Criticism. This volume’s editors have compiled his correspondence with some of the most influential writers of the past century, including Saul Bellow and William Carlos Williams (University of Washington Press, $60). Meyer Schapiro [’24] Abroad: Letters to Lillian and Travel Notebooks edited by Daniel Esterman ’65. Esterman, the nephew of famous Columbia art history professor Schapiro, has collected and edited his uncle’s observations about foreign culture and art (Getty Publications, $39.95). Antiques: The History of an Idea by Leon Rosenstein ’65. Rosenstein explains the drive to own antiques as a historical and cultural phenomenon (Cornell University Press, $35). Network-Centric Warfare: How Navies Learned to Fight Smarter Through Three World Wars by Norman Friedman ’67. The author analyzes the phenomenon of network-centric warfare, a military strategy that relies on highly organized structures for the sharing of information, using historical examples to explain how the technique developed during the 1900s (Naval Institute Press, $32.95). Classroom Virtuoso: Recollections of a Life in Learning by Victor L. Cahn ’69. Cahn recalls his years as a secondary school teacher and college professor while at the same time offering advice to would-be educators (Rowman & Littlefield Education, $32.95). Roses in December: And Other Plays by Victor L. Cahn ’69. This collection of plays highlights the humor, drama and, at times, absurdity of human relationships (Resource Publications, $53). Homer’s Cosmic Fabrication: Choice and Design in the Iliad by Bruce Heiden ’72. Heiden diverges from previous scholars who have limited their discussions of the Iliad to the work’s original function as an oral poem by discussing its merits as a written work (Oxford University Press, $74). Kormushka by Dalan McEndree. This novel, written under a pseudonym by David Weisz ’73, features protagonist Nick White, a former Moscow resident who is asked to return to Russia to investigate the death of a close friend (iUniverse, $18.95). Evidence of Yiddish Documented in European Societies edited by Marvin Herzog, the Atran Professor Emeritus of Yiddish Studies, Ulrike Kiefer, Andrew Sunshine ’79 et al. This collection of articles focuses on the history of Jewish language and culture in Europe (Walter de Gruyter, $112). Law School 2.0: Legal Education for a Digital Age by David I.C. Thomson ’79. Thomson argues for greater inclusion of technology, as a teaching method and an area of study, in law school curricula (LexisNexis, $22). Do-It-Yourself Hedge Funds: Everything You Need to Make Millions Right Now by Wayne P. Weddington III ’84. The author reveals the inner workings of the hedge fund business to would-be investors (Business Plus, $24.99). Womenomics: Write Your Own Rules for Success by Claire Shipman ’86 and Katty Kay. Shipman, an ABC News senior national correspondent, and her colleague Kay provide women with practical tips for balancing careers and home life, stressing the need for working mothers to demand greater flexibility from their employers (HarperBusiness, $27.99). Stages of Capital: Law, Culture, and Market Governance in Late Colonial India by Ritu Birla ’87. The author analyzes the relationship between culture, economics and legal practices in British-occupied India (Duke University Press, $23.95). The Black Girl Next Door: A Memoir by Jennifer Baszile ’91. Baszile’s memoir describes the experience of growing up as one of the only black children in an affluent California suburb [see May/June “Bookshelf” feature] (Touchstone, $25). 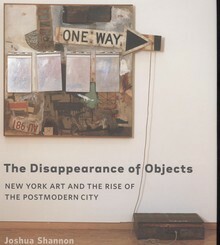 The Disappearance of Objects: New York Art and the Rise of the Postmodern City by Joshua Shannon ’94. Shannon writes about the ways in which changes in the economic climate of New York City during the 1960s affected the work of Robert Rauschenberg, Jasper Johns and other contemporary artists (Yale University Press, $60). 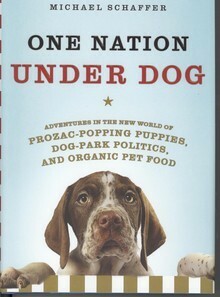 One Nation Under Dog: Adventures in the New World of Prozac-Popping Puppies, Dog-Park Politics, and Organic Pet Food by Michael Schaffer ’95. The author explains recent advances in pet care and what they reveal about American society (Henry Holt and Co., $24). Prophecy, Alchemy, and the End of Time: John of Rupecissa in the Late Middle Ages by Leah DeVun ’97. DeVun examines the life and work of John of Rupecissa, a medieval friar, alchemist and prophet of the apocalypse (Columbia University Press, $50). The Company He Keeps: A History of White College Fraternities by Nicholas L. Syrett ’97. 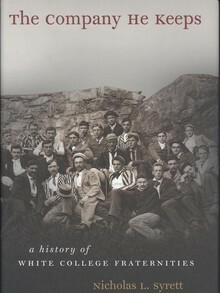 This historical study details the evolution of fraternities as part of the American college system and the consequences that these institutions have had for women as well as for men (The University of North Carolina Press, $30). 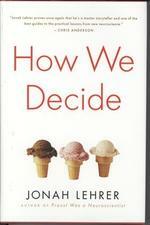 How We Decide by Jonah Lehrer ’03. Lehrer uses recent discoveries in the fields of psychology and neuroscience to explain the complex interactions of instinct and rational thought that occur during the decision-making process (Houghton Mifflin Harcourt Publishing Co., $25). “A Long Time Coming”: The Inspiring, Combative 2008 Campaign and the Historic Election of Barack Obama by Evan Thomas, with reporting by staff writers at Newsweek including Nick Summers ’05. Thomas uses Newsweek’s coverage of the 2008 Presidential race to give readers a clear picture of the inner workings of the McCain and Obama campaigns (PublicAffairs, $22.95). The Body Adorned: Dissolving Boundaries Between Sacred and Profane in India’s Art by Vidya Dehejia, the Barbara Stoler Miller Professor of Indian and South Asian Art. Dehejia describes the portrayal of the human form in the art of premodern India and its relation to religious practices (Columbia University Press, $40).